Anthropology is the worldwide study of humanity, especially in terms of human culture. The discipline is divided into five sub-disciplines or approaches, namely cultural anthropology, archaeology, biological physical anthropology, linguistics, and applied anthropology. Each seeks to find a balance between scientific understanding and appreciation of human similarities and differences, with the applied sub-field representing an on-going attempt to use anthropological knowledge to address human problems. Anthropology majors will be introduced to the various anthropological fields, including archaeology, physical biological anthropology and linguistic and cultural anthropology. 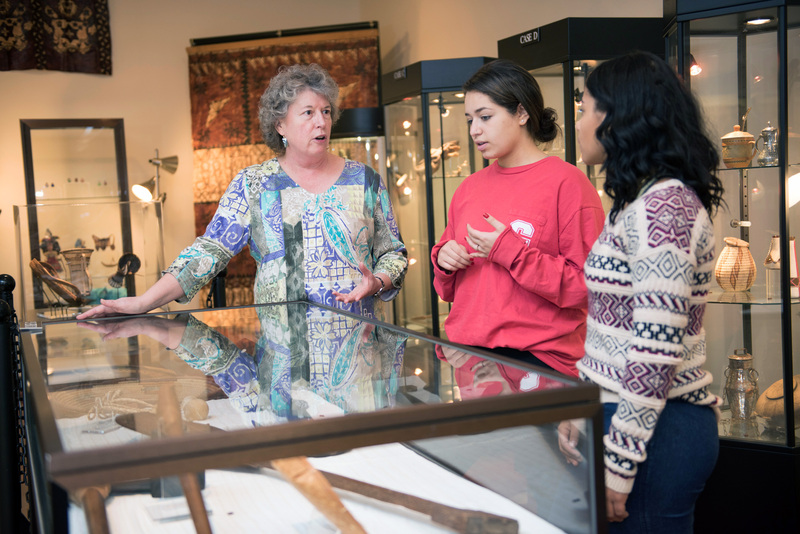 Students have the option of concentrating in applied anthropology, Americas or world archaeology or ethnic studies. Whether or not a concentration is chosen, students will complete a program that provides them with a solid basis for understanding the field of anthropology in general, as well as the human cultural systems of the past and present world. There is also an anthropology minor which is particularly suitable for those interested in the teaching professions who must be prepared for the multicultural classrooms of today's schools. Students who are interested in teaching may combine study in the anthropology major with professional courses leading to a qualification for initial certification in adolescence education: social studies (grades 7-12). Archaeological/ethnographic fieldwork opportunities outside the U.S.
Archaeology is the discipline within anthropology that studies prehistoric and historic societies in worldwide contexts. The archaeological discipline offers a balance between the scientific investigation and culture-based understanding of past societies through their material remains and their environmental settings. Archaeology majors may choose between the Americas or world archaeology concentrations, both of which are seated solidly in an anthropological archaeology paradigm, in which students gain a firm cultural anthropological basis for exploring ancestral and prehistoric cultures of these geographical regions. Students also acquire basic knowledge of the scientific and laboratory-based methods employed in the discipline. There is also a minor in archaeology which is particularly suitable for those interested in the teaching professions who must be prepared to teach about global cultures both past and present. Criminology focuses on the nature and causes of crime, as well as the analysis of crime control policy. The B.A. allows students to pursue focused study in criminology within the context of a broad liberal arts education. It offers the dual options of preparation for immediate entry into employment in the criminal justice area or pursuit of advanced studies in criminology and related fields at the graduate level. With appropriate guidance from advisors, students can combine the criminology major with course work in other areas that will prepare them for graduate-level studies in forensics, computer crime investigation, law, counseling and social work. Sociology is a way of understanding human behavior. The discipline's central premise is that the behavior of individuals is a function of social context: We live our lives as we do because we live among particular others in a particular place at a particular time. Proceeding scientifically and holistically, sociology attempts to understand how, broadly speaking, culture and social structure (the economy, politics, family, religion, etc.) shape the lives of those who participate in them; the ultimate goal of that understanding being to improve the quality of those lives. The sociology program offers a curriculum designed to help students develop their analytical skills and ability to understand conceptual and theoretical material. Courses encourage students to think creatively and flexibly and to broaden their perspectives on the world around them. Sociology majors acquire an educational background that is useful in careers relating to counseling, gerontology, human services, law, law enforcement, probation work, public administration, management and international relations, among others. The major also prepares students for a variety of careers in the private and public sectors that require an understanding of race and ethnic relations, cross-cultural settings, contemporary social problems, and demographic and social transformations in contemporary society. Students are encouraged to take pre-career internships and research experiences for academic credit. Students who are interested in teaching may combine study in the sociology major with professional courses leading to a qualification for initial certification in adolescence social studies (grades 7-12). Degree requirements listed in this catalog apply to all sociology majors.